The Last Two People On Earth Sings at A.R.T. Set Design by Beowulf Boritt, Costume Design by William Ivey Long, Lighting Design by Ken Billington and Sound Design by Daniel J. Gerhard. 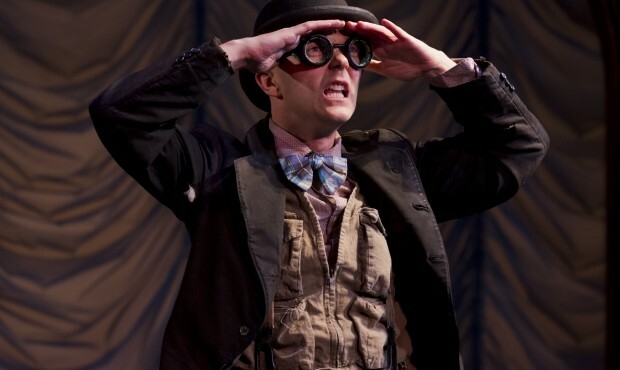 With equal parts Theatre of the Absurd, Stephen Sondheim melodiousness and Al Jolson schmaltz, the American Repertory Theatre's The Last Two People On Earth: An Apocalyptic Vaudeville is a provocatively delightful post-global warming entertainment. With wonderful singing and dancing, it literally balances joy and despair encased in liveliness and potential extinction. Here the dark humor echoes Samuel Becket's Endgame and Waiting for Godot, along with the rhythms and movement of Buster Keaton and Charlie Chaplin to create a strange future-imperfect minimalist world at land's end. 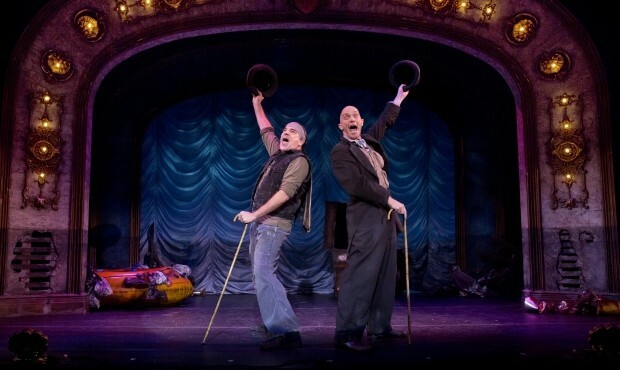 Seamlessly performed with alternating brassiness and grace by Taylor Mac and Mandy Patinkin, it is less narrative than notion. It is a show without much characterization either, but we still get it. Here broad physical comedy, mixes with horrific or tragic images imagined or spoken. This is a musical variety version of The Theatre of the Absurd where the characters are caught in a hopeless situation forced to do repetitive or meaningless actions with dialogue full of clichés, wordplay, and nonsense. The plot is virtually non-existant yet absurdly expansive. With metaphor layered upon metaphor, The Last Two People on Earth is both a parody and dismissal of realism. This world end is a bit Waterworld duie to a global meltdown or if what happened if the Ark had capsized. What do you do at the end of this world? You sing appropriate songs and dance--that's what. Each of the songs Mac and Patinkin weave into the production range from old chestnuts from Tin Pan Alley to R.E.M’s “It’s the End of the World as We Know It” to Stephen Sondheim’s “Another National Anthem.” Sprinkled or rather floated in are " Row, Row Your Boat" and “The Song of the Volga Boatmen." Taylor Mac seems tailor-made for his role. He is the youthful, not very bright (or is it just not sophisticated and not yet world-weary?) optimist. With a great voice and a skilled clown's acrobatic aplomb, he sings and dances filling the stage with his presence. 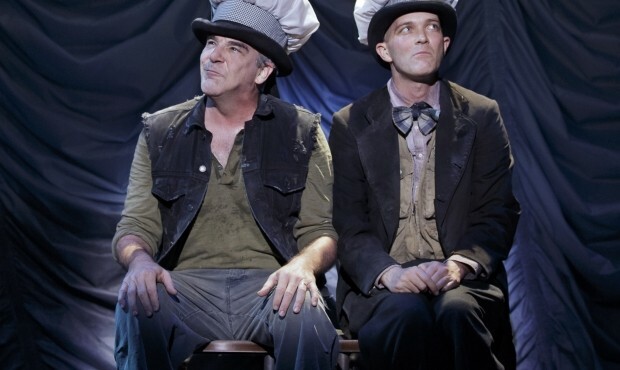 Mac interacts with Mandy Patinkin who is initially depressed, almost catatonic until Mac's character slowly brings him back to life. And Patinkin, well he is Evita's Ché, Sundays' Georges Seurat and Homeland's Saul for gods' sake! His character is the opposite, but strangely similar to Mac's. His character's cynicism and plain exasperation with life is tempered by Mac's character's hopefulness. The two express themselves through performance. 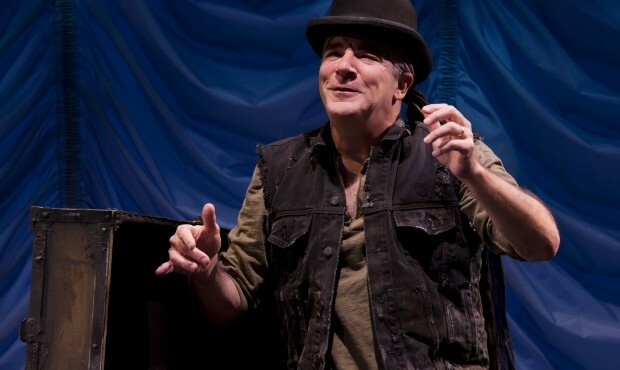 However, we are simply charmed by Mandy Patinkin's talented presence. His every note, twitch and movement is focused upon. Singing, dancing and acting, his is show business greatness. As the show develops, Mac and Mandy become a compatible song and dance team. But are they actually two sides of the same tramp character? What is apparent is most probably not literal here. This adds to the marvelous melange of their performances. Music and dance are the answer. Of course, the question is what is there to do at The Apocalypse, especialy at a rather watery one? Susan Stroman's direction and choreography punctuate the performances. Mixing songs by Richard Rodgers, Irving Berlin, Jerry Herman, Cy Coleman with Tom Waits, Paul Simon and Randy Newman, the music and orchestration by Paul Ford is bouncy and bright with a bit of edge. And the set design by Beowulf Boritt is tacky terrific. This is a thoroughly delightful theatrical profession. This A.R.T. 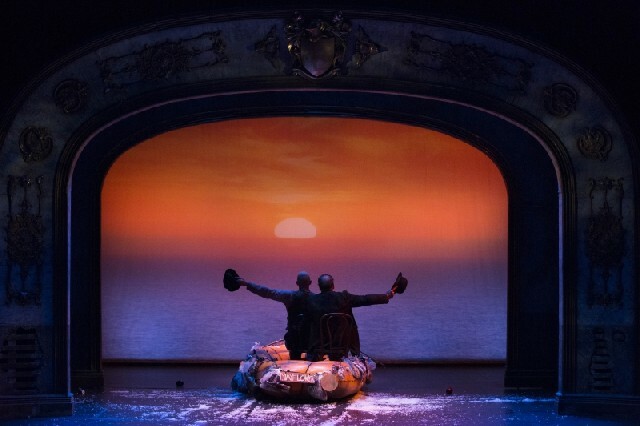 production is a vaudeville of humanity's vindication in the face of a watery abyss, provocative performances and just plain entertainment fun.